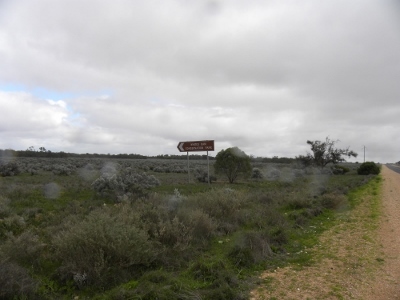 Murray-Sunset National Park: turning North from the Sturt Highway. 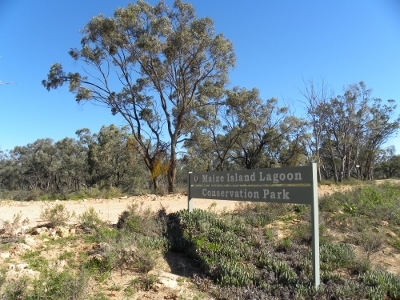 I commenced activations for the VK5 National and Conservation Parks Award on 19th May when I visited the Scott Creek Conservation Park in the Adelaide Hills. This splendid park is near my home. Accompanying me on this occasion was David, VK5KC and we made many contacts, in order: VK1MA, Matt; VK3HRA/p Allen; VK5KGP, Graham; VK5PAS/p, Paul; VK5ATW,Trevor; VK3FDJT, Darren; VK3FMPB, John; VK5NRG, Roy; VK3CRG/p, Craig; VK5HGW, David; VK2MDC, Doug; VK5HCF, Col; VK5KFB, Rod and on 20 metres, VK2AXB, Grant and VK2ELF, Rowan. A number of other activations soon followed: Mark Oliphant (VK5FTTC/p, Rod in Talisker CP; VK5ATW, Trevor; VK5MBD, Bill; VK5PAS, Paul; VK2JTF/p, Shane; VK2XT, Bill; VK1MA, Matt; VK5CZ, Ian; VK5LA, Andy and VK5ZKR, Rod) and Mylor of the 21st May (VK5PAS/p, Paul in Ferries-McDonald CP; andVK2YW, John. 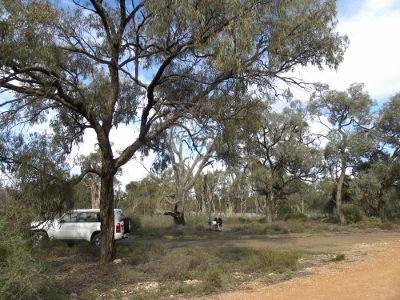 On the 2nd June, when it was threatening to rain, I visited Onkaparinga National Park, VKFF – 402, to activate this park. My wife and I have walked in this park many times and it is great. In my CFS days I helped extinguish a significant fire in this park. I had contacts with: VK2YW, John; VK2UH, Andrew; VK3AFW, Ron; VK5PAS/p Paul; VK3PAH, Warren; VK3ZPF, Peter; VK5LA, Andy; VK5ZLG, Geoff; VK5FMID, Brian; VK3HRA, Allen and VK3ANL, Nick. All my contacts to this time were made using my FT817 (not ND), purchased at Wyong in 2004 and running 5 watts and a home made linked dipole supported at the centre on a squid pole. Then I had a break! Winter ills: a ‘bug’ that I couldn’t seem to shake off. After more than a month I thought I would make up for lost time! 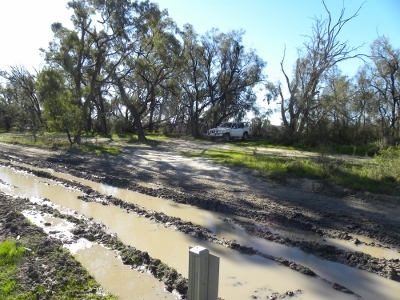 On the 24th July we set off for the Riverland and activated Ridley CP en route to the Riverland. Contacts were made with: VK5EE, Tom; VK5LY, Larry; VK5FMID, Brian; VK5WG, Nev; VK5LA, Andy; VK5HCF, Col; Ian VK3FD/p, qrp 2.5 watts, and VK3AMB, Bernard both in Melbourne. 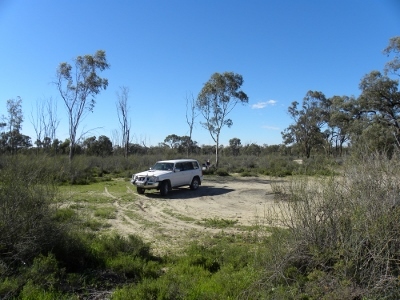 Murray River National Park – Lyrup Flats Section 25th July, VKFF – 372 This park is typical Murray River Flats country and constitutes a flood plain. There are plenty of numbered camping sites for those who want to stay, watch birds, fish or walk. I was quickly on the air in the morning and had contacts with: VK5LY, Larry; VK5HCF, Col; VK3FD, QRP, Ian 2.5 watts; VK7KO, Gerry near Devonport, my home town, and Larry, VK5LY. Cooltong is a beautiful park, the mallee is in great shape and the trees are tall (just visible in the background of the picture). 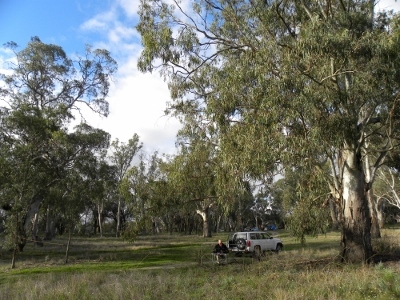 It is my pick of the bunch for a mallee park. Using my new Ten-Tec Argonaut VI for the first time I made the following contacts: VK5HCF, Col; VK5ATW, Trevor; VK5PAS, Paul; VK5EE, Tom; VK5WG, Nev; VK5TN, Robin; VK5LY/m, Larry; VK2XT, Bill; VK5FBAC, Charles; VK2KF, Tom from Kandos on 7.105 checking out his amplifier before the Kandos Group and VK5VW/p4 Mark, who has just moved to Queensland from SA. Mark was delighted to hear someone with a South Australian accent! 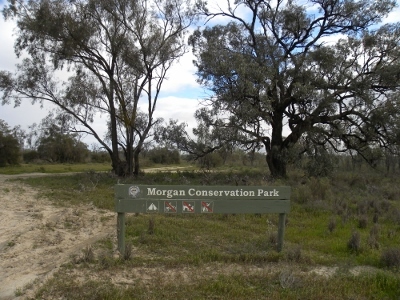 In the morning of 26th July I activated Pike River Conservation Park, which along with MRNP, Lyrup Flats, is very close to Renmark. Contacts were had with VK5LY/p, Larry, who was in the Pooginook CP; VK5PAS/p, Paul, who was activating Mt Magnificent CP; VK3AMB, Bernard; VK5FMID, Brian; VK5EE, Tom; VK3ANL, Nick; VK5HS/m, Ivan; VK3AZZ, Mac; VK3PF, Peter; VK5WG, Nev; VK3ATA, Yuri; VK3KAN/m, Rick; VK5FBAC, Charles; VK5HOS, Owen; VK5ATW, Trevor; VK5LA, Andy; VK5PAS/p, Paul, Finnis CP; VK5FMID, Brian; VK5YX/m4, Hans at Windora and VK5LY/p, Larry at Morgan CP. Larry was able to visit and activate two parks while I had a most relaxing late morning at Pike River CP waiting for the RAA agent to come because our car wouldn’t start. After lunch, and ensuring the car would start x times before setting off, we made a visit to Murray- Sunset National Park, VKFF – 373, in Victoria. Sixteen contacts from this park kept me busy on a beautiful winter’s afternoon with quite a few VK3 calls taking time out to get this park in their logs: VK5WG, Nev; VK5PAS/p, Paul; VK3AW, Laurie; VK3AMB, Bernard; VK4CPS, Paul; VK3ANL, Nick; VK5ATW, Trevor; VK5CZ, Ian; VK3UP, Terry; VK3PHA, David (having his first ever contact) VK2FPQ, Graham; VK5EE, Tom; VK5TN, Robin; VK5FMID, Brian; VK5HS/m, Ivan and VK5LY/p, Larry at Maize Island CP. 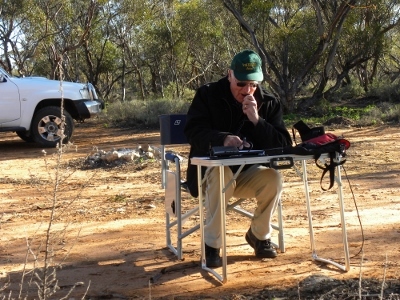 On the 27th July after a visit to Larry’s QTH we set our for Danggali CP: after 23 contacts it was time to pack up and travel back to Renmark. Contacts were had with: VK5KC/p, David at Lowan CP; VK5LY, Larry; VK5HCF, Col; VK5KGP, Graham; VK5HS/m, Ivan; VK3ANL, Nick; VK5ZK, Garry; VK3LY, Bill; VK5PAS/p, Paul SS. 077; VK5CZ, Ian; VK5WG, Nev; VK5LY, Larry; VK3JP, Ron; VK5HOS, Owen; VK3FKAA, Greg; VK5EE, Tom; VK3HRA, Allen; VK5KC, David; VK5PET, Peter, (newly licenced); VK5ATN, Terry; VK5AFW/m, Ron; VK5FMID, Brian and VK5AKH, Andy. 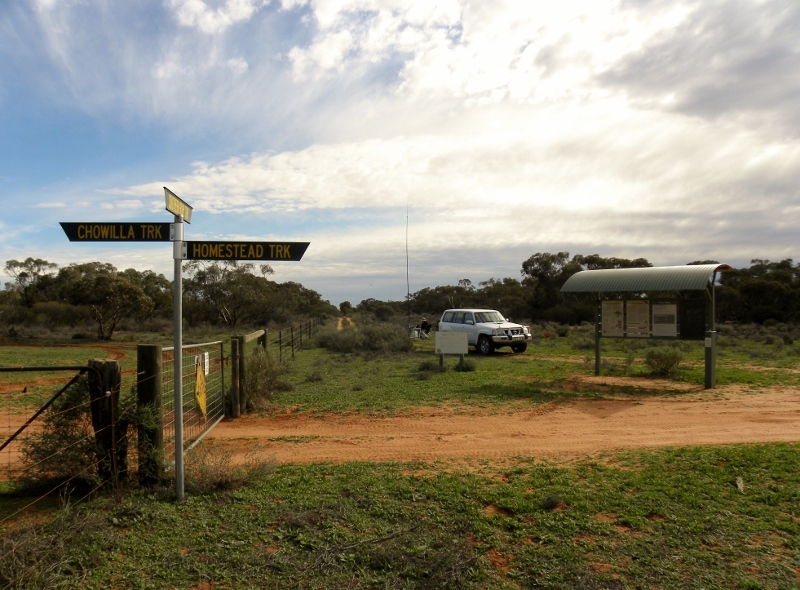 Danggali is about 100 kilometres north of Renmark. It would be a great place to visit with a 4×4 club. Maize Island CP 28th July Maize Island Lagoon CP was a morning destination and the following stations were worked: VK3MBW, Barry; VK3SMC, Simon; VK5LY, Larry; VK5PAS/p, Paul at un-named summit VK5 SE 006; VK5LA, Andy; VK5KGP, Graham; VK5FD, Allan, 3 watts; VK5NRG, Roy; VK5ZTJ/p, Trevor at Burra George; VK5EE, Tom; and VK5HCF, Col.
We did not drive through this! It took us a little while to find this park. From the surrounding cliffs it is quite obvious as a point in the river. It is approached though the Ramco Wetlands which appears to be a council park. A very fine bird hide is provided and after my contacts we spent some watching some of the local water fowl make a living. I worked the following stations: VK5ATW, Trevor; VK5LA, Andy; VK5HCF, Col; VK5LY, Larry; VK5FMID, Brian; VK3ZPF/ QRP, Peter at Beaconsfield; VK5BW, Barry; VK5EE, Tom; VK3ANL, Nick; VK5KC, David; VK3FKAA, Greg; VK5FMID, Brian and VK5PAS/p, Paul at Mt Bryan VK5 SE 001. 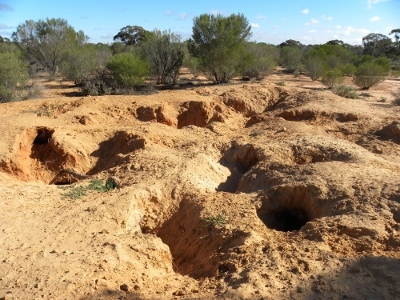 Pooginook CP is home to an introduced colony of Southern Hairy Nosed Wombats and they wouldn’t be very popular if they trespassed onto nearby farmlands and used their earth-moving skills! I had nine contacts: VK7FMPR, Mark; VK5PAS, Paul; VK5WG, Nev; VK5ATW, Trevor; VK5HCF, Col; VK5FMID, Brian; VK3FJAE, Doug from Maryborough and VK5NFB, Don. Whites Dam CP was the second activation before lunch and it was beginning to rain. 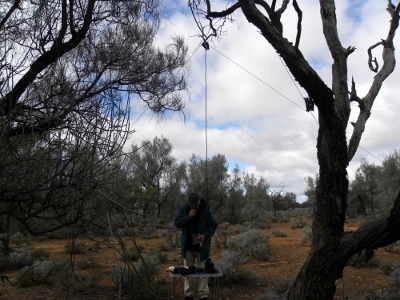 The antenna was set up hanging from a tree and was a bit low. Nevertheless, I had 13 contacts before packing up and heading for Morgan for lunch. I worked: VK5KC, David; VK5LY, Larry; VK5WG, Nev; VK5ATW, Trevor; VK5EE, Tom; VK5ZK, Garry; VK5KGP, Graham; VK5HCF, Col; VK5FMID, Brian; VK2JDS, Dave; VK3RV, Peter; VK5AKK, Phil and VK5TN, Robin. The light rain eased to showers at Morgan CP where we ate our lunch before beginning the third shift for the day. Contacts were had with: VK5LDM, Dennis; VK5LY, Larry; VK5WG, Nev; VK5ZK, Garry; VK5FMID, Brian; VK5HCF, Col; VK5EE, Tom; VK5AKK, Phil; VK5PAS, Paul; VK5ATQ, Trevor; VK5BW, Barry; VK5ATW, Trevor; VK5FMJC, John and VK5KGP, Graham. After Morgan CP I thought we should do something else. We decided to travel on the Waikerie side of the river via Cadell back to Waikerie over a road I have driven many times in an earlier (working) life! 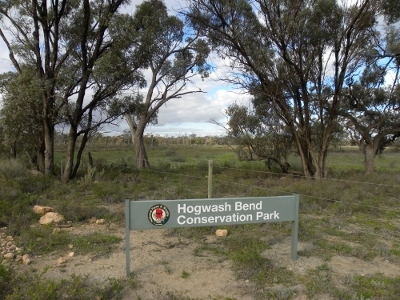 Not far out of Waikerie we saw the sign: Hogwash Bend CP and we decided to investigate. Hogwash Bend is a relatively new CP. I checked the Parliamentary record and it was proclaimed a CP on 6th September 2012. It has always been a popular picnic and camping spot and there were hardy folk camping under canvas when we visited. It is a beautiful park with a sandy beach in the river on the Park side. 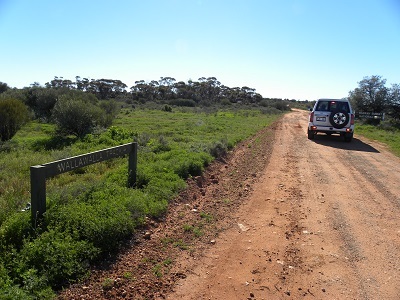 The relevant Government Department (DEWNR) has (in a time of budgetary distress) already improved the signage and placed vehicle barriers across sensitive areas. It was late in the day and I am grateful to the five amateurs who enabled me to activate this park: VK5LY, Larry; VK5HCF, Col; VK3KAN/p, Rick, Bogong National Park in Victoria; VK5EE, Tom and VK5PAS, Paul. 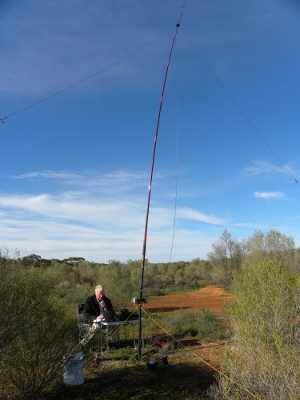 We always enjoy the Riverland and thanks to all who helped to make it fun with keeping track of me via amateur radio. 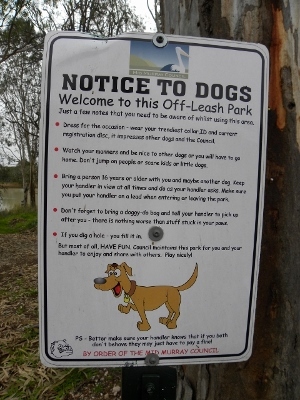 And the dogs of the Riverland are smart!